When you’re shopping for an engagement ring, Pinterest has become one of our go-to resources. Not only is it a good place to find engagement ring trends, but it’s also a wonderful tool for her to get ideas and inspiration about the diamond she loves most. So far, simplicity and minimalism are the top trends for engagement rings. 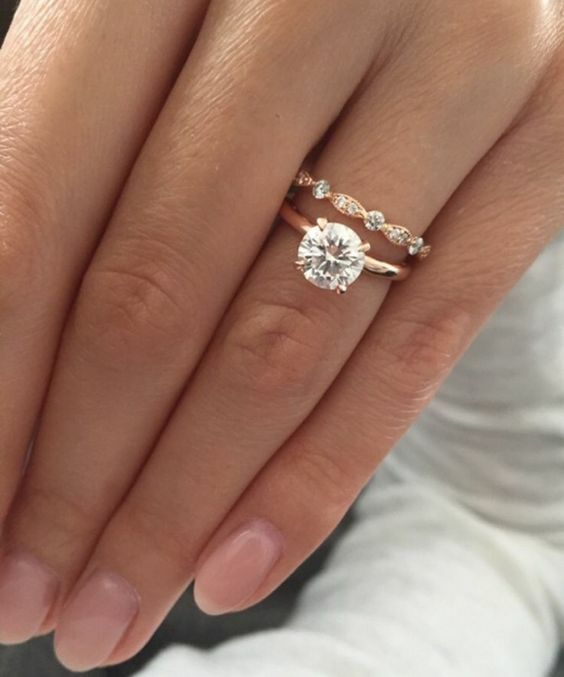 A breathtaking rose gold solitaire ring, similar to this one, has been pinned more than 100,000 times this year! If you’re planning to propose and are shopping for the diamond of her dreams, see how you can draw inspiration from the most-pinned engagement ring. There’s something to be said about the understated, glamorous look of a solitaire diamond. Many women are looking for a ring with timeless beauty, and you can’t go wrong with the solitaire! Without any embellishments, a solitaire diamond has room to truly shine–and complements almost every outfit or accessory she’ll wear. The year of simplicity, and even if she’s not drawn to the solitaire diamond, there are other cuts that can give her a similar look. From emerald cuts to oval diamonds, look for skinny bands and diamonds that take center stage. By choosing a simple band for the engagement ring, it also gives her plenty of creativity when it comes to choosing her wedding band. This year’s most-pinned ring had a rose gold band, giving it a vintage look to pair with the sparkling, fairytale romance of the solitaire diamond. Rose gold is known for its romantic qualities–after all, who can resist the soft pink color? More practically speaking, rose gold is durable, resistant to most scratches, and surprisingly affordable. Based on the amount of copper in it, you can also customize how red or pink the band looks. A 14k rose gold ring will have more copper, so it’ll be closer to red–an 18k rose gold ring, on the other hand, will be lighter and closer to pink. Not sure if minimalism is the best fit for her? Consider using online tools that allow her to virtually try on different rings, so she can see which diamonds shine brightest on her hand. If you want to truly surprise her, consider her style and how much attention she likes. If she’s a trendsetter and loves unique looks, she may want something bolder than this year’s simplistic trend. When you’re ready to purchase the diamond, we have the solution to bulky engagement ring boxes! Check out our compact engagement ring boxes, and keep your ring safe and hidden during your romantic proposal.